ESN Global Media creates and supplies innovative sales & marketing solutions to multiple institutions in the worldwide financial sector. Formed in 2010 by four industry professionals sharing the same vision, together we have quickly established ourselves as leaders in the field, successfully increasing the awareness and accelerating the revenues of our ever-growing client portfolio. In this role, you will provide technical support to the company employees through online chat, email and telephone. Job Requirements:Fluent English written and spoken - MUST! BSc degree in industrial engineering - MUST! Global Company in the finance industry is looking for A Junior PPC Campaign Manager to join our growing PPC Team. לחברה גלובלית דרוש/ה רכז/ת גיוס משאבי אנוש! 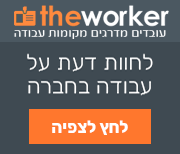 לחברת אונליין מדיה גלובלית ברמת גן דרוש/ה מנהל קמפיינים Junior PPC.